Prepare yourself, people. The holiday season is fast approaching. 1. Sales that start the night before, AKA: Thanksgiving. Like, oh, it's 6 p.m. I guess I've been thankful for long enough? 2. Invitations from the relatives to go shopping with them - immediately after the pumpkin pie. 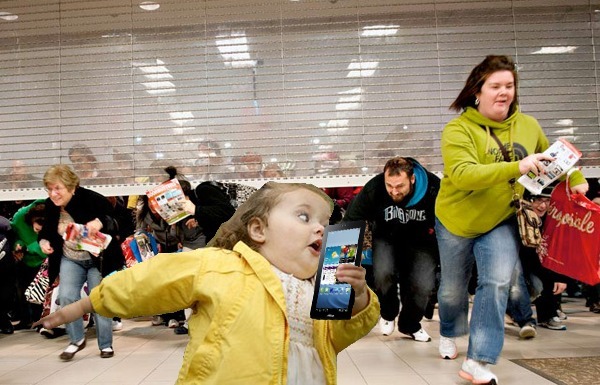 You may have finished your Thanksgiving meal a mere 20 minutes ago, but, faint not, someone will suggest shopping. 3. Last minute shopping proposals from friends. 4. And your not-so-unexpected answer to 'reluctantly' attend. "OKAY FINE, LET'S DO THIS." "Oh my GOSH. They have light-up water speakers - light-up water speakers. We're getting these." "Girl, I know you need to buy gifts for us, but please, do not spend $67 on Bath and Body Works lotion right now." 7. The strange urge to check out the Toys R Us sale. There's just something about the holiday season that calls our inner child to surface. 8. The inevitable likelihood that you will stop at the mall's pretzel shop for a 2 a.m. power snack. Cinnamon soft pretzels offer that much-needed overdose of sugar and salt you'll start to crave during your late-night expeditions. Auntie Anne's is your move. 9. That soccer mom from your little brother's travel team may maul you over in the middle of Target. Forgive the woman - she's got kids, and you know she's on a mission. Maintain your surface composure and walk yourself to the Starbucks conveniently located at the front of the building. Breathe. 10. Accept that Walmart may not be worth the shopping trip. However, the entertainment factor will likely be high. Enter at your own risk, people. No one really knows what to expect from the after 2 a.m. crowd. What happens at Walmart, stays at Walmart. This is the only time of the year you can justify spending $100+ on Santa memorabilia. Get yourself out there and experience the madness for yourself. And remember: Stay safe. Stay savvy. Stay classy.